to distinguish them from any 'normal' use of these words in the description. - n.b. - this page only. No - neither Plimpton nor MECCANO ever supplied that sort of shop!!! By 'Loose Packaging' I am referring to that assortment of small Bags, Boxes, Cards, Envelopes and Trays, which were used, by both Plimpton and MECCANO, to 'control' and / or present many of the less prestigious BAYKO 'bits', such as Rods, Tie Bars or Floors, as well as other 'awkward' parts. Normally this sort of stuff goes under the radar, but, eventually, even the least glamorous bullets have to be bitten! I've also had several requests - at least one of which was to cover this, and related BAYKO set packaging subjects! A surprisingly large range of items have been used, suggesting that, apart from any enhancements to presentation of the sets, other advantages must have swung the pendulum in their favour, the key probably being that it allowed otherwise fiddly parts to be packed, in advance. This would not only speed up the subsequent assembly of complete BAYKO sets, but would also be the sort of job that could, on occasions, utilise any 'spare' time by relatively unskilled factory staff. Click here to find out where these items fit in the overall manufacturing process. …please click here for more on BAYKO Brick Pack Patterns. I've set out the different sections in the correct chronological order in which they first appeared in the world of BAYKO sets. You may notice as you read on, that I've majored on Curved Bricks and Windows. This is deliberate, the rational being to highlight the range of different approaches, at the different stages in BAYKO's life. I hope you find the contrasts useful. As an aside, the 'large trays' - stacked within all but the latest pre-war set #6; the similar ones used within those pre-war versions set #4 and set #5 which mimic the set #6 'coffin-like' shape; and their post-war counterparts which sat on top of set #3 and set #4; - are covered in a section which I have, somewhat artificially, distinguished as 'Large Trays'. Yes, it took me by surprise as well, but Envelopes were definitely the 'ground zero' of BAYKO's Loose Packaging. Paxolin, or similar Resin Bonded Paper, was used to make BAYKO Floors. We're all familiar enough with putting paper into envelopes - perhaps that was the inspiration for using Envelopes to control Floors in the BAYKO set boxes - perhaps. The earliest sets included a Large Floor, roughly the same size as the first BAYKO Bases, and these were probably not included in Envelopes - I've certainly not come across one that big! After those earliest sets, Envelopes, of various types, were certainly the first choice for Floor management throughout the Plimpton era. The first Floor Envelopes [right] were made from a somewhat unattractive, nearly-transparent, 'industrial' type of greaseproof paper, or something very similar, with no decoration or information - or, in deed, redeeming features. I have to assume that when packing the sets, these would have been hidden under the manual, a Roof or a Base, certainly not front and centre! This is one area where expense definitely was spared! Initially Plimpton used just one standard size of Envelope, regardless of the actual contents. They went on to use this approach immediately after the war as well, but at least then they upped the standard of presentation quite considerably. After the war, more conventional, manila Envelopes were used, presumably based on ease of availability. There was printed information on the front, which evolved but a little, and these Envelopes continued in use for the rest of the Plimpton era. Firstly [left] the printing on the Envelopes was in Black ink. Secondly [right] the printing on the Envelopes was in green ink. In content terms, the main difference between the two is that the Black ink Envelopes [left above] are generic, i.e. they were used for all BAYKO sets. The Green in ones [right above] are specific to each set and have had all the company, address and patent information removed to make way for the set number. The generic Floor size table was also replaced, by a set contents table and the font used for “The Original Plastic Building Set” is more ornamental on the Green ones [top right corner]. During the MECCANO era, no Envelopes were used, the Floors being housed loosely, sometimes partly controlled with an elastic band, alongside, or, more accurately, under the new-style flat Roof Sections, within the conventional internal packaging sections. Shortly after Envelopes made their appearance, came the emergence of BAYKO Cards, which are somewhat totemic in this context, very much pointing the way to the long term, structured approach to BAYKO set packaging. Although I'll never be able to prove it, I believe the origins of BAYKO Boxes and Trays start with simple 1930s cards [left below] onto which BAYKO parts like Pillars were stitched to allow them to be both secure and neatly displayed. It's easy to see the advantages of controlling parts like Pillars, which, unfettered, would have been far too mobile for the marketeers! In this and many other similar cases, the completed Cards would then actually have been glued [inconsistently] into their final position in a purpose-made slot within the BAYKO set cardboard interior structure. The Ornamental Additions Sets, [A, B and C] which were introduced in the early months of 1935, were the trail-blazers for Cards [left], and sufficient have survived, so that no speculation is necessary. These cards were clearly seen as a success, and their use continued in the 20s series special sets [right] - how else would you control yet display such a fiddly, awkward item as the 1-Brick Pillar? Not only that, but there was a section of the box interior into which Square, Long and Short Turrets were arranged, and this card was then laid inside them - effectively corralling them as well! Although the initial tooling costs for this type of Card would have been significantly more expensive to produce than the type of Card originally used for the 3-Brick Pillars [above left], the consequential factory packaging labour costs would have been substantially less, and would also have required much less skill to complete each Card. One nerdish point - the twenty four 1-Brick Pillars shown on the Card were actually referred to, in the set contents lists, as eight 3-Brick Pillars. Is that why they are displayed in rows of three? The other Card shown here [left] demonstrates that the use of Cards continued through the 'New Series' period, and right up to the war. At this point, I must mention elastic bands. I think the 'new series' Card [above left] perfectly illustrates the negative aspects of elastic band [over] usage - they do the job, but pretty they ain't! Notice the V-shaped 'nicks' which had to be cut into the Card, to corral the elastic bands which corral the bits! …click here for more information on BAYKO Brick Pattern Cards. However, don't forget they also lead directly to the Trays, Bags and Boxes discussed below, so they represent a significant stage in the evolution of BAYKO's packaging. …seriously, although I've had to replace the brittle, desiccated original elastic band which was still in place, this was exactly how these parts were displayed in immediate post-war austerity BAYKO sets. When austerity abated, and cardboard became both readily available and affordable, the use of Cards ceased, as Plimpton returned to their original approach to set box interiors. This doesn't mean that the use of other 'Loose Packaging' items also ceased, merely that Plimpton switched to less labour intensive methods, often also achieving superior standards of display. This is an area which touches the pre-war sets less than their post-war counterparts, and they are certainly less well known. In the earliest sets all the Rods were secured with elastic bands and either placed in specific 'troughs' within the fixed interior cardboard structure of the BAYKO set box, or hidden underneath a Roof. Other loose parts, as they emerged, such as Base Links [plus screws, etc.] and Tie Bars were treated in a similar manner. However, for some strange reason, set #4, from the mid 1930s, is a noble exception! …click here for more information on BAYKO's Logos. I'm sorry, but I don't know which of the two set #4 formats, i.e. conventional flat box or set #6 chest type, was involved here. Post-war it was very different, though not initially! As the BAYKO business was rebuilt after the war, there was a heavy emphasis on the smaller sets, particularly the new entry level set #0, which didn't have a Roof that you could hide Rods under. …click here to jump direct to the Bags information. The operational benefits in terms of simplifying the BAYKO set packing process must have come to be recognised, because, as austerity's grip loosened, Plimpton decided to dive, apparently enthusiastically, into the use of Boxes. Firstly, [left] starting in 1947, I believe, Plimpton effectively mirrored the Bag colours, printing in red ink on a white, paper-covered box lid. Initially, and maybe intermittently, until austerity finally abated, the Boxes had plain card bases. Eventually, however, the bases were also produced in white, paper-covered. …please click here to email me if you've got an image of one. Around 1949, Plimpton [left] settled on the use of green ink printing, on creamy-yellow, paper-covered Boxes. These lasted, with minimal shade variations, until after the MECCANO takeover in September, 1959, but not quite up to the end. Finally, [right] post the 1959 MECCANO takeover, there was a brief flirtation with black ink, but still maintaining the creamy-yellow, paper-covered Boxes, similar to those mentioned above. Why this late change? Well, it may have been something as simple as a cost saving exercise - standardising, across the MECCANO group, on a single ink - but that, of course is pure speculation. …please click here to email me. For completeness I should mention that different sets, of course, had different sized Boxes. The key parameter, in this context, being the length of the longest BAYKO Rods in the set, which effectively determined the diagonal of the Box - to make sure that they would fit in the box. Stepping back a little in time, the Boxes must have been regarded as an operational and / or a presentational success, because Plimpton went on to extend their usage. These additional Boxes [right and below left] were created with the launches of set #3X and set #4, in 1951 and 1952, respectively. The new Boxes, with printed contents details, were used for many of the so called “Supplementary BAYKO Parts”, which were included, for the first, indeed the only, time in these sets. The common denominator, among the parts concerned, seems to have been those smaller pieces which would have been significantly less stable within the normal Brick Pattern Cards format - such as Corner Bricks, Crazy Paving, Side Bricks and Side Windows. The Side Windows are the only one of these parts which could perhaps have been put onto the Brick Patterns Cards, but were, understandably, kept alongside the matching Side Bricks. The chosen colour scheme matched the accessories boxes, though with the occasional colour drift. This is a clear example of production practicality outweighing the marketing desire for visibility if not fancy presentation! On a personal note, in 1959 [such wonderful timing(!)] I wrote to Plimpton suggesting that they offer Accessory Sets for sale. Specifically, what I had in mind was, to create packs of all the windows and doors from a set #3 and [separately] from a set #3X. …and these sets could have been sold in Boxes, just like these, with zero capital investment. Anyway, back on track, personal rant over, that's the limit of Plimpton's extended usage of Boxes for BAYKO set packaging. I feel fairly confident that these two were never popular on the Sales and Marketing side of Plimpton management, as they did nothing to project the product, particularly the number and variety of extra parts available in these two sets. MECCANO had always boxed the nuts and bolts in their own sets, so must have been comfortable adopting the basic Plimpton concept. However, they greatly simplified their accessories Box format [left below] and removed all the set contents data from the front of the Box. Their significantly cheaper Boxes were, uniformly, a slightly orange shade of yellow card with truly minimalist decoration, bearing only the product logo and the set number, printed in red ink, similar in shade to the red bricks of the period. The size of the MECCANO era boxes always seems to provide a looser fit than their Plimpton equivalent I don't know the reason for this, and I can only suggest that it relates to the greater use of packaging mechanisation, or plans for it, by MECCANO, This would certainly have required greater tolerances, and well may have been significant in this context. There is just one additional use of Boxes in the MECCANO era. In an unusually cost conscious decision, MECCANO management plumped for Boxes as their preferred method of corralling the more awkward BAYKO parts. MECCANO's solution [right] was a simple one - they used a cardboard Box base, with a rigid Cellophane, or similar, completely transparent lid / cover which slid neatly inside it. As you can see, there was absolutely no attempt at presentation of the parts, other than the fact that they were colourful and visible. The operational benefits, however, would have been substantial, with significantly lower labour requirements to get the parts into the sets, by this innovative method. The supply chain would also have been greatly simplified by this move, with no bespoke cardboard Trays to be designed, tooled and cut, nor would their various individual stock levels have had to be managed. The size of these MECCANO era Boxes, not surprisingly, varied for the different sets. As long as they were big enough, the actual Box dimensions didn't really matter in the grand scheme of things, and were chosen to suit the internal set layout. These actually come in two categories. The simplest, only found in the 'peak period' set #3 and set #4 are really a removable part of the actual set box structure, trimmed in blue to match the external box colour. I'm aware some of the early set #3 were, of course, in red, and that green also featured briefly. These are not the sort of tray I'm covering here - they held Loose Packaging items. In the early pre-war chest format set #4, set #5 and set #6 there were also similar trays which were effectively removable parts of the set box structure, so they too are not covered here. The Trays I'm talking about here cover a range of specially made, folded pieces of card, usually with some form of cut-out slots which could hold the more oddly shaped BAYKO pieces securely, while making them clearly visible when the set lid is opened up for toyshop display. Sometimes the Trays were housed in cardboard box bases. The earliest BAYKO Tray I've come across [left] was in a small 'new series' conversion set #2C. It wasn't a common pre-war occurrence, but very much points the way forward - and it's elastic band free! The second example [right] comes from a 1946 austerity set #1, and shows that Plimpton had gone back to using elastic bands, but here with a Tray rather than the earlier Cards. I have also show [below] several other trays, this is not meant to be a comprehensive display, but to give you a flavour of how ubiquitous they became. Whatever the origins, the advantages of pre-packed Trays of BAYKO parts, particularly in terms of efficient packing of completed sets, made their continued, in deed their expanded use a 'no-brainer'. By far the best known BAYKO Trays are the ones [left] which were designed to hold Curved Bricks and Curved Windows, etc. These were presented in a box base, and wrapped in Cellophane. This is quite up market in presentation terms, but must have been a bit pricey. There were both single and double Window versions of this Tray, with different 'extras', and they were ubiquitous throughout the 1950s, and even on into 1960 after the MECCANO takeover, with at least one of them appearing somewhere in every Peak Period BAYKO set. When set #3X and set #4 came along, in 1951 and 1952, respectively, as I've already mentioned, new Boxes were introduced to support them. Well, in a parallel innovation, they also introduced three new designs of Trays, and not just for the so-called “supplementary parts”. Firstly, [right above] the 'Spans' Tray. Apart from the fact that all the parts are a bit monochromatic, this Tray, very much designed on the Curved Bricks Tray model, is a very effective Tray - to my mind, at least. Secondly, we have the 'Gables' Tray [left]. This just houses the two Gable Roofs, together with their Roof Ends. These Trays follow the same format again, though without the cellophane wrap. I really can't help but think that Plimpton could have done a much better job in terms of space utilisation - you could easily have halved it! Finally, we have the 'Bases' Tray [right]. This was a very much more basic, cut and folded, single piece of card. The effective presentation of the Bases wasn't bad, an improvement, perhaps on the standard flat presentation of one or two Bases, but again, the spatial utilisation! I've always thought of myself as a fan of set #4, but Plimpton's design really doesn't measure up to, say, MECCANO's set #15 in green terms - I know that was unheard of back then, but simply in terms of transport costs, MECCANO must have saved themselves a fortune! If you think about it for a minute, planning, designing and tooling-up for these Trays must also have been quite expensive, and may well have helped sow the seeds for MECCANO's ultimate decision to move away from Trays altogether. That's right, they didn't use them at all. 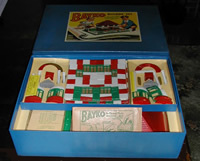 I believe, in a 'tail wagging the dog' sort of way, that it's highly likely that the specific number of certain of the BAYKO parts included in some of the BAYKO sets, from all periods, was directly influenced by the need to optimise both the number of, the contents of, and the appearance of, the range of BAYKO Trays. Although I've already said that MECCANO didn't use Trays, they did copy many of the set contents from their Plimpton predecessors, and so would have been indirectly affected. The origins of the first BAYKO Bags lie in post-war austerity, with it's material shortages on the one hand, but a post-war victors' 'can do' attitude on the other. Then, somewhat surprisingly, they re-emerged, briefly, after the MECCANO takeover. The earliest post-war BAYKO sets in 1945/6 had zero internal cardboard features, so there would have been no way of stopping parts, like Rods, rolling about in transit - not great for projecting a quality product image, to say nothing of the potential for actual damage to more vulnerable bits. It must have been self evident that some form of constraint, preferably offering 'softness' to enhance the protective aspect, was needed. Presumably making the choice of Bags, over Boxes, must have been driven either by cost or availability. The latter certainly applied, but I can't vouch for the former. Whatever the rationale, Plimpton chose to use the small, white, drawstring bags, [left and right] printed on a single surface, in red ink. Printing the contents on the Bag, wasn't strictly necessary, but certainly lifts the impression created, and was probably justified on that alone. …occasionally the set contents data was printed horizontally [left] [i.e. along] the length of the Bag. That should be viewed in contrast with the overwhelming majority of Bags, which were printed vertically [right] [i.e. across] the Bag, as shown here. This sort of variability would certainly appall modern marketeers, for whom consistency in brand presentation is everything - it seems, to the outsider, to verge on the obsessive! …click here for more on BAYKO Logos. Hidden deep in the bowels of this BAYKO set was the small plastic Bag [left] which held all the 'new' parts which had been introduced, by Plimpton Engineering, after BAYKO inventor, C.B. Plimpton's final innovation stream had been completed, in 1951. …in fact it was this modest little bag that finally pushed me into creating this oft-requested page. …click here for more on this information slip. Dating this set isn't too difficult, it contains the August, 1959 manual. The move from just putting these extra parts loose in the set to creating a purpose-made [then] modern Bag suggests the passage of time, so I'm pretty certain that this is a MECCANO issue of a Plimpton set #3, probably from 1960. As far as I know, that really is that for bags - as far as I know! I'm sorry for the confusing labelling of this section, but I wanted to be able distinguish these much larger, usually multi-component, units from their much smaller equivalents covered in the 'Trays' section above. Perhaps the best way to think of it, is that these large units ['Large Trays'] were more easily labelled as 'structural', often holding other categories listed above, as distinct from the smaller 'Trays' which always sat within the BAYKO set box's internal cardboard structure. ► Pre-War Set #6, etc. The image [left] shows set #6, with two of its 'Large Trays' displayed in front of the main set box. The 'Large Tray' containing 'Oak' Corner Bricks shown, within the set box, at the front shows where all the 'Large Trays' are stacked. As can be seen [click anywhere on the image to see a larger image] these 'Large Trays' had cloth 'tabs' to lift them out. This 'coffin-like' box shape was also used, for a brief period, c. 1935 or 1936, for both set #4 and set #5. They both used the same internal 'Large Trays', of identical shape and size as for set #6, though fewer of them. 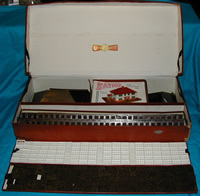 Both set types had internal cardboard 'lifts' to bring the top tray to the right level. I'm afraid I can't tell you why this set box format change occurred, unless it was to bask in set #6's reflected glory! ► Post-War Set #3 and Set #4. The two 'Large Trays' covered in this section are much more familiar to BAYKO collectors. The internal cardboard structure of both the BAYKO set # 3 [left] and set #4 [right] boxes included support ledges, upon which the 'Large Trays' sat, suspended, as it were, over the top of the remaining contents. As can clearly be seen, the set #3 'Large Tray' covered just part of the set, whereas the set #4 'Large Tray' covered the entire set. Presumably for cost-saving reasons, facilitated by their position right on top, neither of these 'Large Trays' had the cloth 'tabs' to lift them out of the box, unlike their pre-war cousins. …click here for more info. on these 'Brick Pattern Cards'.